At an age when most kids have fun and play on their mind, Tanmay Bakshi, 12, is busy developing apps. Tanamy who is being home-schooled in Ontario, Canada is the world’s youngest app developer and has been programming since he was just five. Recently Tanmay addressed 10,000 developers in Bengaluru, India at IBM’s Developer Connect 2016 demoing his recent creation ‘AskTanmay’. On the lighter side, Tanmay loves to play table tennis and coding is like a fun activity for the 12 year old genius. Well let’s hear it all from the horse’s mouth. So Analytics India Magazine (AIM) interviewed the whiz himself and here’s what Tanmay had to say. AIM: Tell us something about your journey of being one of the youngest app developer in the world. Tanmay: My journey of being one of the youngest app developers began when I was 5 years old. At this age, like most other kids, I did not have much to do. I used to see my dad programming, and I was intrigued by a computer’s power to display something on screen, or even add 2 numbers. My dad introduced me to a little bit of Batch and FoxPro programming, and after that, I started using the internet as a learning resource; I learned more languages like C/C++/Objective-C and VB, and when I was 9 years old, my first iOS App, tTables, was accepted into the iOS App Store. Also, nowadays, I like to program in languages like Swift, Java and Python. In fact, I’ve also authored a book called “Hello, Swift! – iOS App Programming for Kids and Other Beginners”; the early release is currently available here: https://www.manning.com/books/hello-swift In fact, I truly wish to get my book signed by Amitabh Bachchan. AIM: Would you like to share something about Watson? Tanmay: IBM Watson is an amazing set of powerful APIs that allows developers to create cognitive-fueled applications, with ease. I found out about IBM Watson a few months ago, when I stumbled upon a documentary about it; it truly fascinated me as to how a computer was able to play Jeopardy and win against the 2 best human competitors. And so, I did some research about Watson, because I wanted to get to the root of it, and in the process, came across Bluemix, and found out that Watson had become a set of APIs. I created a few YouTube tutorials about its APIs like Retrieve and Rank, Natural Language Classifier, Text to Speech, Speech to Text, etc., and some applications too, one of those being AskTanmay, an NLQA (Natural Language Question Answering) System. AIM: Would you like to share about some of the apps that you have developed? Tanmay: Sure. I have been developing apps for a couple of years now. The most interesting story related to my app development, is that I have my apps and share those through various media. Of course, the very first being the iOS App Store, where I have 6 apps. 3 of my favourite include “tTables”, “tID Vault”, and “I Can, We Can!”. I have also released a number guessing game for the Apple Watch and iPhone, called “tGuess”. Next comes a lot of apps that I have created for my readers, and are in my book that I have authored; in fact, almost every concept that I teach in my book, has an app to support it. 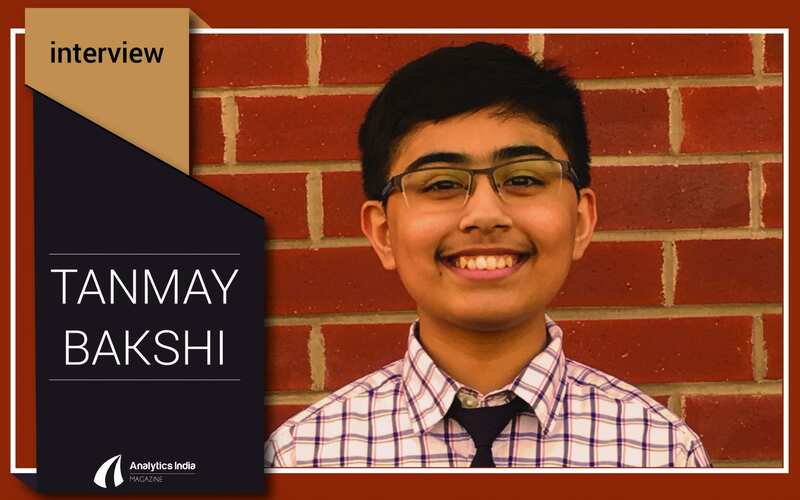 Last but not the least, my YouTube channel; I have a YouTube channel called “tanmay bakshi”, it has 89 videos, all of which are tutorial-focused, and again, I teach concepts using apps that I build for almost every tutorial. AIM: Tell us something about world’s first web-based NLQA system powered by IBM Watson, ‘AskTanmay’. Tanmay: Well, it’s a pleasure to share with you, AskTanmay. This is the world’s first NLQA System to be powered by IBM Watson, in fact, AskTanmay uses Watson’s Natural Language Classifier and Alchemy Language services. IBM Watson is used in the ATD (Answer Type Detection) step, to detect what the user is looking for, and the CAFS (Candidate Answer Filtering and Scoring) step, to filter out garbage from the candidate answer list. Put simply, Watson is the brain of AskTanmay. Also, AskTanmay is currently 70% Swift, 20% Java, and 10% Python code. I first presented this at my Keynote at IBM Interconnect 2016 in Las Vegas in February; and in fact, at IBM DeveloperConnect 2016 in Bangalore, I open-sourced AskTanmay for the developer community to use, learn, and contribute to it. And at DeveloperConnect, I also launched the second version of AskTanmay, with 5 big updates. I look forward for AskTanmay to play KBC with Amitabh Bachchan, just as how Watson was able to play Jeopardy with Alex Trebek. AIM: Off late, Artificial Intelligence is seen entering most of the industries and taking over what humans can do? What are your thoughts about it? Tanmay: Well, to begin, I’d like to say one thing: You should not be afraid of AI. What I mean by this is that sometimes, people think that “AI will take over our jobs”, or “AI will replace humans”, and stuff like that. However, I’d just like to say that this is IMPOSSIBLE; there’s a reason that it’s called ‘Artificial intelligence’, not ‘intelligence’, and so, I believe that we should accept the future of AI. Another point is that this “AI” trend is a transition from regular, plain and simple computing, to machine learning, and all transitions are painful initially. However, transitions have to be made. And so, AI is most certainly the “technology of the future”. It breaks the “computers can only do math” boundary, by introducing computers to Natural Language, using math. It will, in fact, create a lot of jobs, replace some redundant jobs, and put them to more useful ones, which it is unable to replace. AIM: What are the most significant challenges you faced in the Artificial Intelligence space? Tanmay: Well, mainly, the biggest challenge would be the starting point. Since computers are not made to be programmed with “machine learning in mind”, the beginning part of starting out with AI is very hard. However, systems like IBM Watson make it easy to use cognitive in your applications, in fact, as a service! AIM: Could you tell us the most important contemporary trends that you see emerging in the present Artificial Intelligence space across the globe? Tanmay: Mainly, it would have to be the rise of robots powered by Cognitive services, like IBM Watson. For example, the Nao robot, which is powered by IBM Watson, has been installed in places like Hotels and Banks, to provide human-like service to consumers, quickly, efficiently, and cost-effectively. IBM Watson’s machine learning capabilities are also helping doctors in the medical field, by sustaining the information it learns, and being able to remember every single punctuation mark. Things like self-driving cars, and even your YouTube recommended feed all use Machine Learning.